CHESTNUT HILL, Mass. 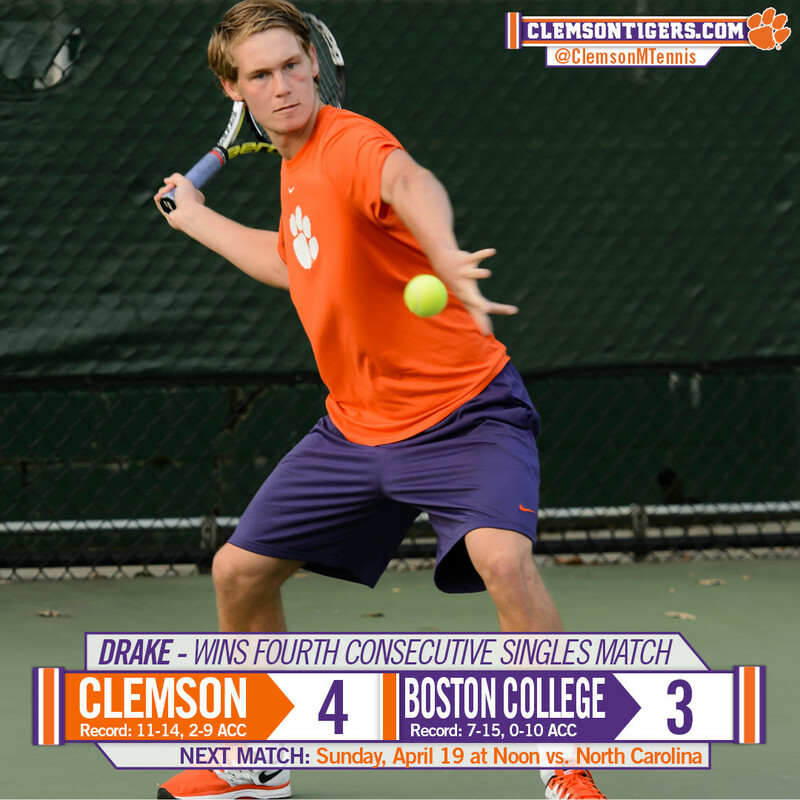 – The Clemson men’s tennis team salvaged a weekend road trip with a 4-3 win at Boston College Sunday afternoon. The Tigers lost the doubles point, but fought back and won four points in singles play to take the match. The win makes Clemson 11-14 on the season overall and 2-9 in ACC play. Clemson’s duo of Robert Dudley and Luke Johnson played at No. 1 doubles for the first time this year together, falling in a tiebreaker, 8-7(3), to Boston College’s duo. At No. 2, Clemson’s Hampton Drake and Daffra Sanon were tied at 7-7 with their BC counterparts before the match was left unfinished. Clemson’s duo of Austin Ansari and Christian Harris played at No. 3, falling 8-5. In singles, Clemson picked up wins at No. 3, No. 4, No. 5 and No. 6 to clinch the match. Drake, a freshman, won his fourth consecutive singles match in dominating fashion, rolling to a 6-1, 6-0 win at No. 4. Dudley followed close behind, closing out his competition 6-2, 6-0 at No. 5. Harris rallied for a tough win at No. 6 to pull Clemson within one point of clinching the match, then Daffra Sanon, a transfer from the University of Washington, clinched the win for Clemson with a 4-6, 7-5, 6-1 victory at No. 3 singles. Clemson’s Johnson, playing in the No. 1 slot for the first time this year, fell 6-4, 6-4 to Boston College’s Philip Nelson while Ansari fell at No. 2 singles in three sets. Clemson plays its final match of the regular season on Sunday, April 19 at noon at the Hoke Sloan Tennis Center in Clemson. It is the final home match of the season for the Tigers, and the team’s senior co-captains, Hunter Harrington and Alejandro Augusto, will be recognized prior to the match.